Cut the eggplant into rounds allowing three slices per person and place these on baking paper, setting remainder aside. Bake in the oven at 180°C for 20 – 25 minutes, until almost cooked. Sauté onions and garlic with the cubed eggplant until soft. Add tomatoes, herbs and tasty cheese, tossing gently in the pan until the cheese begins to melt. 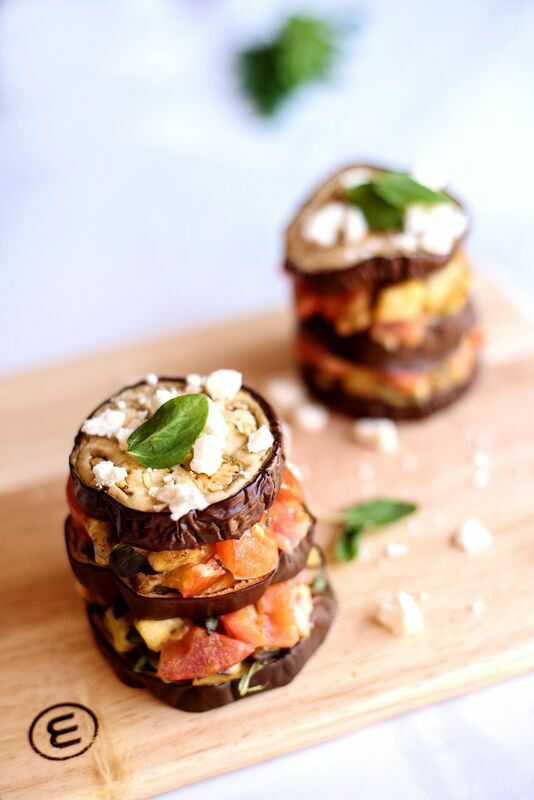 On the baking tray, assemble eggplant rounds with layers of the tomato mixture in a stack. Top with crumbled feta cheese. Return to the oven for a further 5 minutes to heat through prior to serving. Return to the oven for a further 5 minutes to heat through prior to serving.